The very decorative columns, in composition plaster with wooden inner frames and well painted to imitate marble, the wholes having circular tops with moulded edges, on octagonal wood bases, and surviving from the last quarter of the 19th century. The columns are in fair to good overall order, they have suffered knocks and scuffing and overall they remains in fairly good decorative condition, pleasing that they have not been restored in any way. There are nibbled losses to the top edgings and some fissures though nothing that has affected their stability. Please refer to the photographs for a full visual reference. These types of plinths would be best utilised for busts, urns and statuary, being particularly suited to neoclassical pieces, and metallic or stoneware items. Shades of Sir John Soane, the Grand Tour and all that is imposing and decidedly important. 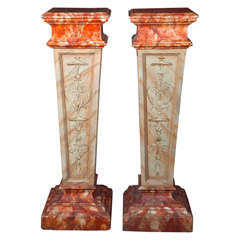 Pair of painted faux marble pedestals with stepped base, tapered body and stepped top. Each side with added panels. A pair of faux marble pedestals. 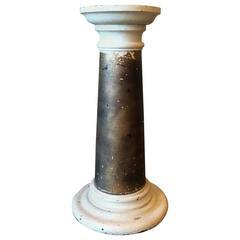 Substantial 19th century marble pedestal from France. Measure: 40 inches height x 17 inches wide top 14.5 inches. 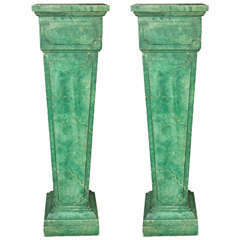 Pair of column style pedestals. 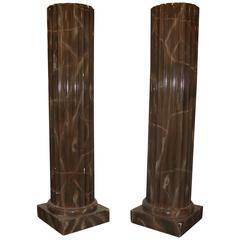 The pair of pedestals come in a column style with a brown, marble like appearance. 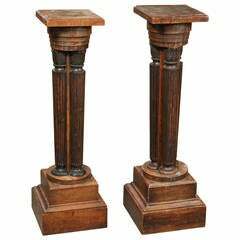 Late 19th century French pair of classical pedestal stand plinths. Decoratively painted, turned pine, pedestal or plant stand circa 1940s in a Victorian style. Pair of marble Regency period neoclassical plinths or pedestals Each carved with Greek key or meander motif Large and in very good condition.